The saying goes: keep your friends close and your enemies closer. So why shouldn't the Bulldogs and Gophers be paired for their fifth game in a fifth arena and for the second time in the Eastern Time Zone? It seems like years ago now, but the 50 or so people who were in attendance for the first game of the Ice Breaker Tournament in South Bend back in October saw the first step in a long season culminating in the newest, most important game for these rivals. record against UMTC. Full season stat comparison is noted at right. Maybe most luckily for the Gophers is their hot streak coincides with the start of the NCAAs. While UMD has seen many struggles since the calendar turned to 2015. 8-9-3 since the start of the calendar year and one win in their last seven games, UMD needs a spark. And that needed spark may be the return of Alex Iafallo, back from mono starting today against the Gophers. Iafallo is tied for second in overall points (8G-17A-25pts) and tied for first in points per game (0.78) with line mate Dom Toninato who also missed games with an injury. Toninato leads the team in goals with 16. Bringing the pieces back into place, the promise of regaining the early season success is promising for Bulldog fans. One piece that was great early and has been just good as of late is goaltending. Freshman Kasimir Kaskisuo is the guy the team relies on. And he will need to be on his game and get help from his defensemen to find the shutdown play he had consistently in November and December. Ready for success that has been on the horizon most of the year, Bulldog fans are patiently waiting to find the right mix from early in the season. If the season has to end, please be it not at the hands of the Gophers! After years of modest and not so modest boasting, the prognosticators of the NCAA field have been bested, or at least incorrect. The Committee used creativity to create an NCAA bracket that had many with puzzled looks on their faces. Nonetheless, the field has been set and now we get to sit back and enjoy the games. As the annual tradition goes, Andy Fiskness and Andrew Craig make their picks and anyone filling out brackets should be aware that our track record is not very good. A grain of salt should be taken. Picks by @afiskness. The final 16 teams have been announced and set for action. The Bulldogs join in the fun after taking last weekend off. Hopefully the time off will help them focus. Five other NCHC teams are set to play as well, including eight former WCHA teams. This is showing that the tide might be turning back to the western teams for college hockey dominance. Minnesota Twin Cities vs Minnesota Duluth: This is of course the fifth time they have played this season, each in a different arena. Iafallo's return will give the Bulldogs much needed spark. I think this game is a when you play them type of game and the Gophers are hot now. I expect to see the Gophers come out like the third period of the North Star cup and end the UMD season. Saint Cloud State vs Michigan Tech: This is a great matchup. The Huskies from Saint Cloud have found a stride and the Huskies from Houghton know how to score goals. Tech feasted on their conference scoring 16 goals in a weekend against the Chargers and 15 against the Seawolves. They also scored big in bunches in their wins against Big Ten opponents, Wisconsin and Michigan. Saint Cloud's defense will be too much and they will get the win. Quinnipiac vs North Dakota: If this game wasn't in Fargo this would be a Bobcat win, but I have to pick the suddenly struggling North Dakota Mens hockey team to win. Boston College vs Denver: The Eagles are rested after watching the Hockey East Finals from their couches and the Pioneers are coming off a NCHC consolation championship. I like the Pioneers to advance. Providence vs Miami: The Redhawks should be able to roll even with a short bench. Havard vs Nebraska Omaha: The Crimson are coming off an ECAC championship and the Mavericks are rested after not making it to Minneapolis last weekend. This game could be a coin toss after not knowing what Mavericks team will show up. I will go with Mavericks win. Picks by Craig (@CollegeHockeyHH). There is a marked change in the "balance of power" in college hockey this year towards the West. This is evident in the entrants to the tourney and the non-conference results from the season. That is not to say that an eastern team will not win it all, but looking at the probability simply from numbers the West has an advantage. Looking at the draw, there is not clear-cut winners out of any region except for the West Region where I am confident North Dakota will prevail. Again this is the only seemingly easy one to pick. Saint Cloud is on a roll, but the environment will be hostile just as the former name of the UND squad was. And I am not even convinced SCSU will make it to Saturday. At the end of a late day on Saturday, North Dakota will pull off a win over Michigan Tech. I want to call this the weakest of the four regions, but maybe least competitive is a better describer? Omaha is an enigma right now and they very well could come out of nowhere (Omaha, NE) and take the region, but they may also have a problem with Harvard in the first round. In the end it will be Omaha advancing to face Mankato with the red Mavs of Omaha defying the odds and making the Frozen Four. In what was expected to be the regional of the Boston teams (BU and BC), the bracket makers went away from bracket integrity and moved BC to the East Regional. What is left is an interesting and most unexpected, meeting of intra-state rivals Minnesota Twin Cities and Minnesota Duluth. Much has been made of the Bulldogs and Gophers upcoming fifth meeting in a fifth arena with UMD holding a 3-1 lead. Even in their loss, the game was tilted in favor of UMD. The Bulldogs will win the fifth meeting and take not he Terriers of BU Saturday with BU moving on. The East arguably has the toughest region with Miami, Denver, and BC together. Throw in Providence with the games in Providence, RI and it is top to bottom strong. Keeping it short, Miami will lose to Providence fueling the fires of unrest among the college hockey faithful of Oxford, OH who are crying foul from the start moving Providence home for no reason other than attendance at the root. Moving on, DU - BC game will also be regional winner and in this case it will be the team from the West, Denver. The NCHC Frozen Faceoff has arrived, beginning later today in Minneapolis at the Target Center. For the second year in tournaments existence the Bulldogs did not earn the right to play in the house of Da Kid. This year though, the season is not over for UMD like last year since the Bulldogs will be in the NCAA playoffs. The Bulldogs this year have been up and down. The first half of the season the team played quite well and scored at will. The second half of the season the team struggled at times and was shutout in three games. In fact since Christmas their record is 8-9-3. Thankfully before Christmas the team played so well which kept their pairwise ranking high. Now for this year's Frozen Faceoff any of the four teams have a chance to win as this is a very balanced field. North Dakota is again the favorite, but the neutral ice will be a different environment then they are used to playing in. I expect to see Saint Cloud jazzed up for their two games knowing that their NCAA playoffs are on the line. Whereas the other three teams truly do have less at stake. An interesting byline in these conference tournaments will be attendance. My guess is there will be nowhere close to a sell out at Target Center, Xcel Energy or Joe Lewis Arena this weekend for any game. The Thursday night games at the Joe saw announced attendance of about 3,500 people. Saint Cloud State vs. North Dakota: It is hard to pick against North Dakota but I think the Huskies really want this. This game should have pretty good attendance even though it is the afternoon game and will mostly feel like a home crowd for North Dakota. I will pick an upset with the Huskies winning. Miami vs. Denver: This is a rematch of last year’s championship game. Denver has played really good hockey recently, but my gut says Redhawks. This year I think the Redhawks will get revenge and earn the right to play in the Championship game. Third Place: If my picks are right this will be two uninterested teams as both Denver and North Dakota have nothing to play for. I will say this ends in a tie. Championship: I like the Redhawks to get past the Huskies and get the autobid to the NCAAs. College hockey in the west became very wild two years ago when the WCHA broke up and CCHA disappeared. The just completed regular seasons have proven that teams in the west can survive and thrive. Currently in the PWR, the NCHC and WCHA have eight teams ranked in the top 16 including spots 1-5. It may not have been the way that some school would want change to occur, but Minnesota State Mankato and Michigan Tech cannot be unhappy with their first and second place finishes respectively in the WCHA. MSUM is currently #2 in the PWR and MTU #5. The top rankings of WCHA teams is not from easy opponents either. MSUM has played the 13th ranked strength of schedule (SOS) and owns the best overall winning percentage in the nation at 0.7714 (26-7-3). Likewise, MTU has taken the schedule given and run with it achieving a 27-8-2 record, third best in the nation at 0.7473 winning percentage. Now with the first home playoff series since 1993, MTU is on the verge of taking the next step to the WCHA Final Five and likely onto the NCAA Tournament. A trip to the NCAA's would be the school's first since 1981. On the other side of the West's story is the NCHC, arguably the most powerful conference in the nation. Currently the NCHC is working on their sixth team in the top 16 of the PWR. Most likely all six will not make it, but there is the distinct possibility that five will make the NCAA's. 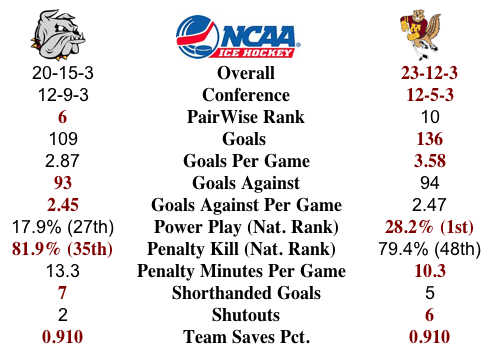 The depth of the league is most demonstrated by Minnesota Duluth who is currently on the road at Denver for the first round of the NCHC Playoffs despite currently holding the #4 PWR position. Fans around the western region have questioned the PWR math, but the SOS of the NCHC teams make it a reality. The eight teams of the NCHC hold the top eight SOS positions in the nation. The strength of the conference lies in the success of the members in non-conference games and the even play in conference. Going into the last weekend of NCHC conference play, UMD had the chance to be anywhere from second to fifth. Even with a win on the weekend, coupled with a loss, the Bulldogs still found themselves in fifth again a testament to the strength of the NCHC. There continues to be banter and "inside knowledge" of big changes forthcoming in college hockey west, right now the WCHA and NCHC are basking in the limelight of conferences that came out of the fray in good shape and getting stronger. I am tired of the high road. We tell the kids and the whiners that officials don't decide games, the players do. How the players respond to situations and use their talent. On Friday night in Denver, I have never been so sick of that high road on officiating mantra. Ty Loney netted a hattrick with the third goal being the game winner. The part of that last goal that sticks with me is the call. It was a redirection by Loney of a Quentin Shore shot that appeared to be with a high stick. Upon extended review by the officials, it was ruled a goal. Upon re-review the next morning, I am still sick to my stomach watching the "goal." Partial, yes, but this one looks easy. What should make it an even easier no-goal call was watching Loney's reaction after the play. When you score a hat trick and goal that gives your team their first lead of the game, you are going to celebrate. Loney's first move was to look right at the official nearest him and skate off slowly, arms at his sides. Signs that he knew his stick was high? Yes. He didn't even try to sell that it was a goal. As he stood at the bench waiting for the review, you could see Loney's expression of growing confidence. Like when you know you are getting a big break, a benefit of the doubt. Loney should not apologize for the goal nor should he go and admit that he believes it was a high stick, it is just one of this instances where the officials get in the way of the game. Nothing was in the bag for UMD or DU at the time, so the Bulldogs could have lost anyway. That is just not the way any team should have to lose a game. Additionally, it would have been the second disallowed goal for the home team in the game. If that had any bearing on the decision, it is ridiculous. In fact I feel ridiculous writing it, but that thought crept in my mind last night and I haven't been able to shake it. Trend or Mirage. For the second time in Bulldog history, they went a whole regular season without being swept in a series. The other being the National Championship season. Through the wins, losses, and ties, the Bulldogs have built a resume that will most likely get them into the NCAA Tournament. But does this feel like a team that has the fortitude to succeed in the playoffs? Since the calendar turned to 2015, it is difficult to find that stretch of more than a game where the team looked the part of #4 in the PWR, currently a #1 see in an NCAA Regional. There are players missing, especially now, but it has never felt like the team to beat. The downside has seemingly always been greater, especially today. Coming off the 3-0 lost at Western last Saturday with the captain Adam Krause's suspension for kneeing into last night's come from ahead loss that happened AT Denver because UMD could not finish in the top half of the conference, it may be a dour time for Bulldog fans. Yes, UMD won a National Championship in 2011, but fans memories fade and tend to remember just the last games. Hopefully, the 2014-15 Bulldogs can forget all that has happened and play in a new day today. In brief, for it is close to the start, the second season starts tonight. With the #3 PWR ranking in tow, the Bulldogs head out on the road to Denver to face the #8 PWR team for the first round NCHC playoff best of three series. Yes, the season has been good for UMD as far as rankings but late season failures to close out NCHC series has the team on a first round road trip. 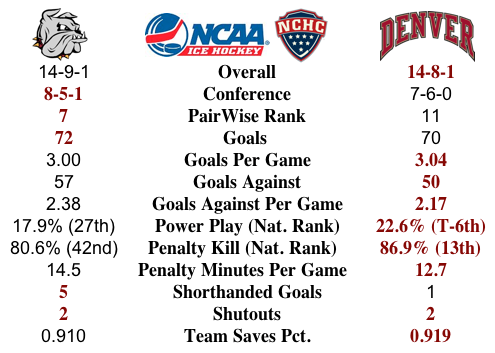 It turns out, as noted below in the StatPack, Denver and UMD tied for record in conference, but it is the shootout wins, a stat not figured into win percentage, that pushed Denver to fourth and UMD to fifth. Picks by @afiskness. The regular season has wrapped up and the playoffs are set to begin. The Bulldogs go to Denver to play for their chance of advancing to Minneapolis. The Bulldogs road success will be needed for them to get by the Pioneers. Also, with the end of the regular season the NCHC announced the all conference teams. For UMD several players made the list. Andy Welinski made the second team, Dominic Toninato made the honorable mentions and Kasimir Kaskisuo the all-rookie team. With the conference being so tight I think you could see all sorts of upsets again this year. I truly think three of the four series are coin flips. 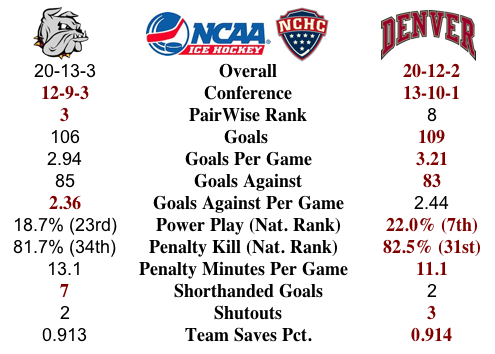 #6 Minnesota Duluth @ #7 Denver: The Bulldogs have been a better road team this year, their recent play has been up and down. I expect the Bulldogs to get at least one win, but Denver wins in three games. The coin says UMD. Western Michigan @ #5 Miami: The Broncos have been inconsistent of late. I don't think they will win the series, but their slow down game will get one win. Redhawks take the series in three games. The coins says Miami. #RV Saint Cloud State @ #8 Nebraska Omaha: The Huskies swept the series earlier this season at Saint Cloud and I like their chances in Omaha. I will pick the Huskies in a sweep. The coins says Nebraska Omaha. Colorado College @ #1 North Dakota: The pesky Tigers are not good enough and will be swept in Grand Forks. The coins says North Dakota. Look into the crystal ball. Where will UMD need hotel reservations at for the first round? Will they need to travel? Likely yes for traveling and that may be due to shootout losses as chronicled in the Duluth News Tribune. 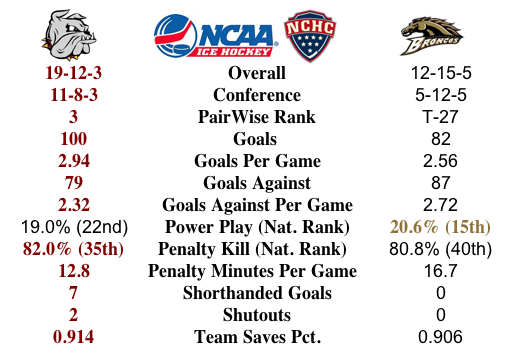 Nonetheless, UMD needs to break out of their NCHC slump and their Western Michigan slump. Last NCHC sweep was December 5 and 6 against seller-dweller Colorado College who UMD only gets once on this year's schedule. But UMD also only played one series against UND also. So, win and home ice is a definite possibility…lose once or twice and home ice is gone. Picks by @afiskness. Who will get the Julie and Spencer Penrose Memorial cup comes down to the final weekend in Oxford, Ohio. We do know that North Dakota will have at least a share of it, but a sweep by the Redhawks and there will be co-champions. As for the Bulldogs last weekend’s ties at home kept them in the race for home ice in the first round of the playoffs. Personally the way the Bulldogs play on the road compared to at home, I think they may have a better chance of making it to the Target Center for the NCHC playoffs if they are on the road. I would like to see one more win to get the team to 20 wins and I think that will absolutely secure an NCAA bid. #6 Minnesota Duluth @ Western Michigan: The last time these teams played the Broncos controlled play. I like the Bulldogs chances this weekend for a sweep, but I will pick a split. #1 North Dakota @ #5 Miami: Great matchup that doesn't need analysis and will end in a split. North Dakota wins the cup. Colorado College @ #8 Nebraska Omaha: The Mavericks won't have any trouble at home with the Tigers this weekend. Mavericks sweep. #7Denver @ #RV Saint Cloud State: The Huskies are licking their wounds after a sweep in Grand Forks and the Pioneers are looking to secure home ice. This will be a split.